Discussion in 'NASCAR chat' started by gnomesayin, Apr 12, 2019. Helping out with the suggestion to create a sponsor news thread. Glad to see this topic move away from the Deathbed thread, which opening always felt like walking through a puddle beneath a leaking sewer pipe. You'd try to skip over it, but sometimes it's too wide. Here's an article centering around activation as it relates to Toyota's sponsorship of the Richmond races. Toyota Owners 400 Weekend at Richmond Raceway will see loyal Toyota owners exposed to a number of perks that builds brand loyalty and has others asking, "How can I get in on this?" Sponsorships have changed dramatically in sports over the years. The days of just seeing signage at an event has shifted into a myriad of ways that businesses work to activate deals to give them maximum exposure and return on their investment. For motorsports, sponsorships are the life blood of the teams, and tracks. No longer satisfied with 200 mph billboards, sponsorship deals have gotten creative in not only establishing brand but building out relationships at the track that eventually culminate in sales. For those watching on television this weekend, the ToyotaCare 250 NASCAR Xfinity Series race on Friday, and Toyota Owners 400 Monster Energy NASCAR Cup Series on Saturday night under the lights at Richmond Raceway may appear to just have “Toyota” as an entitlement sponsor to highlight a car manufacturer that sees drivers such as Denny Hamlin, Martin Truex Jr., or Denny Hamlin at the wheel. But at the event, how Toyota is engaging with customers that have purchased their vehicles, or thinking about changing car or truck brands, is setting a standard that other sponsorships should look to. As a way of rewarding loyal Toyota customers, as well as working to lure others to the brand, multiple levels of hospitality are provided at the race. That can include special Toyota owners parking where you simply show your key to gain entry; to light food and drink hospitality areas; to driver meet-and-greets; to a Toyota based autocross course that drivers will take loyal owners through; to having passenger cars and trucks on display to examine up-close; to having access lanes for Toyota owners to get in and out of the track easier. All of which provides a massive brand presence at Richmond Raceway. While being part of this “hub”, Toyota will gather information from existing or possibly new customers that filters into leads for potential sales. The entitlement sponsorship and how it is activated shows a direct correlation to sales. Regionally, Laukes said that sales have increased 8% in the Richmond area while within the region the increase is 6%. And while not all of that is attributed to the entitlement sponsorship of the ToyotaCare 250 and the Toyota Owners 400, there’s a firm belief that is playing a strong part in it. A key aspect of sponsor engagement at NASCAR events is the amount of time that customers are at an event. Given that the Toyota Owners 400 Monster Energy Cup Series race is at night, that dwell time is longer, and thus allows Toyota to continue to relationship build. For Tanner Hulette, Vice President Page Auto Group, there is a direct tie between not only customer sales through the Toyota activation at Richmond Raceway, but service and maintenance. “There has been a regional effect,” Hulette says. “We have seen initial customer growth through ‘conquesting’ – bringing in customers from other car brands over to Toyota. But the larger story is what it’s done for the ownership experience and the parts and services aspect.” Hulette went on to say that due to the direct connection to customers at the events, it’s leading to an increase in seeing vehicles serviced at Toyota dealerships. For Richmond Raceway, having Toyota as a partner moves beyond just the races that will take place this weekend. It provides year-round relationship building. Ultimately, sports sponsorships are about bringing an audience to a product. 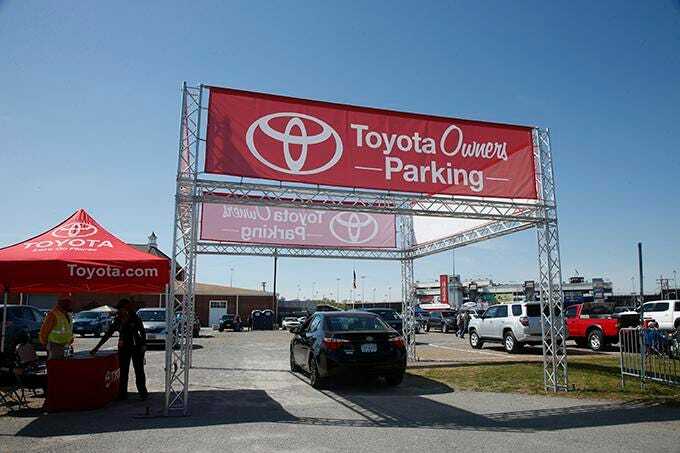 Toyota’s presence at Richmond Raceway – not only visually with traditional brand exposure through signage, but in engaging and providing experiences to current and potentially future car owners – is a successful one. The synergy between the track, its location within the region with NASCAR fans, and Toyota make it a strong bond that provides a benchmark for others. AuzGrams, ToyYoda, LewTheShoe and 3 others like this. Great article and an endeavor like this should really boost attendance pre race and for the race itself. The activities sound fun and jumping the que is a really good idea. 2 Sweet, StandOnIt, Turtle84 and 2 others like this. This Wall Street Journal article about Monster portrays it as losing market share and facing increasing serious competition that is fragmenting the energy drinks market, including a threat from Coke itself and several more supposedly health-focused drinks. Monster still has the biggest market share in the US, while Red Bull is far and away the leader globally. With Monster departing as title sponsor, this is probably more relevant because other energy drinks will be able to advertise in NASCAR again, and there are many new ones coming. Monster represents just over 40% of energy-drink sales in U.S. retail stores. The king of energy drinks is in need of a boost. Monster Beverage Corp. MNST +0.81% is losing market share, fighting in court with an upstart competitor and trying to stop its biggest partner—Coca-Cola Co. KO +0.97% —from releasing an energy version of Coke. Now Keurig Dr Pepper Inc. KDP -0.57% is jumping in with an energy drink developed by Lance Collins, the entrepreneur behind successful brands including Fuze tea, BodyArmor sports drinks and Core bottled water. His new drink, Adrenaline Shoc, is meant to appeal to consumers looking for less sugar and more natural ingredients, Mr. Collins said. It is a consumer shift that beverage industry analysts say Monster has struggled to address. Monster accounted for 41% of energy-drink sales in American retail stores in the four weeks ended April 7, down from 45% a year earlier, according to an Evercore ISI analysis of data from IRI, a market research firm. Meanwhile, a new entrant called Bang has quickly captured about 9% of the market. A Monster spokeswoman referred to its previous comments, criticizing Bang for “false and unsupported” health claims. At an investor meeting in January, Monster CEO Rodney Sacks said fitness-oriented energy drinks like Bang will end up expanding the category, allowing Monster to continue to grow. Other players are crowding into the category:Anheuser-Busch InBev SA in 2017 bought organic energy-drink startup Hiball Inc. And Amazon.comInc. just launched its own energy drink under its Solimo brand. Coca-Cola, which owns an 18.5% stake in Monster and distributes the brand through its bottling network, has developed a drink called Coca-Cola Energy that is already being introduced in Europe. Monster says the move is a violation of an agreement the companies struck in 2015; they are in arbitration. Bang also has drawn Monster into a fight. In September, Monster sued Bang’s parent company, Vital Pharmaceuticals Inc., alleging that it doesn’t contain creatine, the ingredient it touts prominently on its cans, and that the company had made false health claims about its product. Monster also raised concerns about those health claims with the Food and Drug Administration, according to a person familiar with the matter. Monster’s March launch of Reign was a parallel attack on Vital, with the new brand’s packaging and flavors closely mirroring Bang’s. Vital has sued Monster alleging trademark infringement and refutes Monster’s charges. Monster called Vital’s trademark suit a bad faith attempt to slow its Reign launch. Keurig Dr Pepper has taken a significant minority stake in Adrenaline Shoc with a path to ownership and will distribute it nationally. Terms weren’t disclosed. The deal comes unusually early in the brand’s development. Typically startup brands build sales on their own before striking a national distribution agreement. This one has yet to appear in a single store. Keurig plans to launch it in June. With the energy-drink category fragmenting, Keurig Dr Pepper said it wants to offer consumers a range of options. It already owns two small traditional energy-drink brands and earlier this month said that it would distribute Runa Clean Energy, an organic energy drink with caffeine derived from the Guayusa leaf. Runa is owned by All Market Inc., which also owns Vita Coco coconut water. Adrenaline Shoc has no sugar and contains caffeine derived from green coffee beans, yerba mate, coffee-bean fruit extract and guarana. 2 Sweet, Turtle84, LewTheShoe and 1 other person like this. This is fantastic. Blaney already has a personal sponsorship with BodyArmor, it would be cool to see different drink makers in the mid-field. Not to take anything away from Coca-Cola, but seeing more brand activation in the mid-field to see BANG, BodyArmor, Essentia+ (Personal sponsor for John-Hunter, water comapny), and others to talk about their products IMO. Great for competition and business, I think NASCAR is going in the right direction with this. Back in 2006 at Daytona, I still remember trying all of the new energy drinks when they were first released in Monster, NOS, Full-Throttle, Vault, etc. All had a piece of the pie in the fan area, it was cool to see. Adam Stern tweeted about Monster on Monday, including an interesting comment from a Kroger manager in Agusta, GA.
Kiante, Turtle84 and gnomesayin like this. Kiante, AuzGrams and LewTheShoe like this. Once again, it proves NASCAR marketing has been effective. The key is Kroger has spent the money necessary and has pushed hell out of themselves and other contingency sponsors. Great job on Kroger's part and much appreciated. 2 Sweet, LewTheShoe and Ventisca like this. This latest multi-year agreement gives the fast-growing series long-term stability at one of the most famous racing venues in Europe. This agreement will join others already reached with Brands Hatch in England; Zolder, Belgium and Hockenheim in Germany to give the series secured events through the 2024 season.